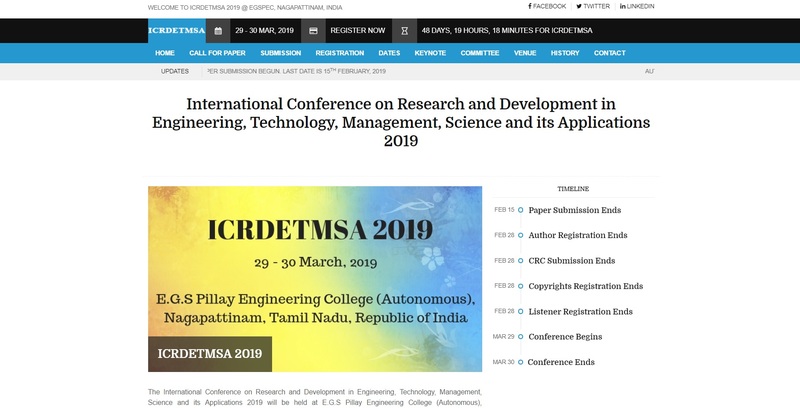 The International Conference on Research and Development in Engineering, Technology, Management, Science and its Applications 2019 will be held at E.G.S Pillay Engineering College (Autonomous), Nagapattinam, Tamil Nadu, India, Asia. The conference aim is to provide a platform for researchers, engineers, academicians as well as industrial professionals from all over the world to present their research results and development activities in Engineering Technology, Industrial Engineering, Application Level Security and Management Science. This conference provides opportunities for the delegates to exchange new ideas and application experiences face to face, to establish business or research relations and to find global partners for future collaboration. ICRDETMSA 2019 ONLY accepts unpublished research papers in English. Submitted conference papers will be reviewed by technical committees of the Conference. All accepted papers will be published in the conference proceeding by Association of Scientists, Developers and Faculties and indexed by EDLIB which in turn indexed by other major indexes.